Starting off as a promising startup named Foodiebay in Gurgaon back in July 2008, Zomato has grown into one of the world’s leading online restaurant discovery sites with over one million restaurants listed globally, while operating in over 10,000 cities across 24 countries. The services they provide include information and photos of restaurants, online ordering, table reservations and management, and users reviews. While Zomato takes care of your cravings for good food, Zingoy takes care of your wallet with a satisfying side serving of cashback. Order you favorite food through Zomato using Zingoy, and earn some delicious cashback on every purchase. Make your Zingoy links for Zomato and share them with your foodie friends and family and earn more Zomato cashback on all orders placed via your links. 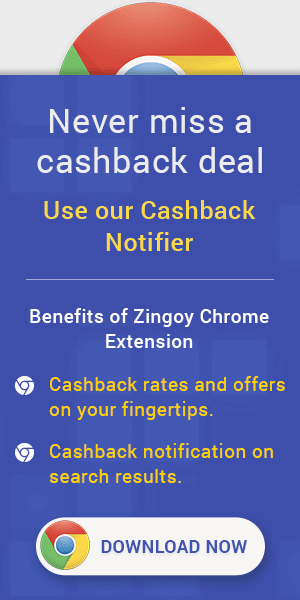 Zomato LazyPay Cashback Coupons : You will receive a 50% cashback upto Rs. 150 on your first LazyPay transaction on Zomato and the same will be deducted from your LazyPay outstanding amount. Offer is valid only on your first LazyPay transaction on the Zomato App on iOS & Android using code: LAZYPAY150. Offer is valid for transactions between 15th April to 30th April 2019 only. Now get flat 50% Off Upto Rs.150 on Zomato Pick up orders. Offer is applicable for New Users only. Get flat 50% Off Upto Rs.100 on Zomato Pick up orders. Offer is applicable for Old Users only. Limited period offer. Zomato Food Offer: Now Get Flat 50% Discount on Food Orders by Zomato. Maximum discount of up to Rs.100 can be avail. Offer is valid 3 times per user. Offer is only applicable on select restaurants & select users. Zomato Restaurant Offer: Now get Flat 50% Off on Select Restaurants Orders from Zomato. Maximum discount of up to Rs.100 can be avail. Offer is applicable for select users only. Limited period offer. Zomato Food Order Discount Promo Codes: Now Get Flat 50% Discount on Food Orders by Zomato. Maximum discount of up to Rs.100 can be avail. Offer is valid 3 times per user. Offer is only applicable on select restaurants & select users. Limited period offer. Zomato Snacks Offers : Now Get Flat 50% Off on Snacks Order from Zomato. Offer is valid from 3 Pm - 7 Pm only. Applicable on Select Restaurants &only. Applicable for Select Users only. Limited period offer. Now Get 50% Off on Food Orders from Zomato. Maximum discount of up to Rs.75 can be avail. Offer is only applicable for Select Users. Zomato Domino's Coupon : Get 25% Off on Pizza order. Zomato Domino's Offers : Maximum discount that can be availed is upto Rs.200. Offer is applicable for all users. Apply coupon code to avail this offer. Zomato Axis Bank Offer: Get flat 20% off on your first order on Zomato, maximum discount Rs. 100. Apply promocode on the payment page. Make payment with Axis Bank credit or debit card. Zomato Discount Offers on Food: Now Get Flat 30% off upto 300₹ on Orders Above 300₹ on Zomato. Offer is applicable on Selected Restaurants only. Offer is valid 3 times per day. Zomato Domino's Offers : Now Get 25% Off on Domino's Pizza Order. Maximum discount of Rs.200 can be avail. Minimu order amount of Rs.500 & above is needed. Limited period offer. Zomato Discount Offer: Now order Food from Popular Restaurants at Zomato and get upto 40% discount. Coupon code is not required. Checkout the landing page for more details. Zomato Discount Offer : Now order your Breakfast, Lunch, Dinner, Drinks & Nightlife, Desserts & Bakes and more from popular restaurants from Zomato and get up to 30% discount. Coupon code is not required. Checkout the landing page for more details. Looking for the best restaurant where you can eat out at with your friends or family members? Zomato helps you find such places in India and many other countries. If you also want to order your favorite food from such restaurants, you can do so on Zomato. Browse through them and their menus to check if they have what you love the most. Indeed, these are fantastic offers you shouldn’t miss enjoying. On top of these offers, there are other amazing Zomato coupons you can also grab on this page and earn cashback too on that. Once you decide the specific food products, you want to buy from Zomato or the best restaurants you would like to eat out at, you can browse this page to find the Zomato promo code that fits your order. If you don’t find a promo code for your particular order, which is rare, you can still earn cashback on it. Just copy the Zomato link, paste it in the Joy of Sharing section on top of this page, and click the ‘Get Link’ button. Use the link generated to buy and share it with friends. If any of them will order food using your link, you will earn Zomato cashback. Indeed, it’s great to use this Zingoy page whenever you want to do something on Zomato. You will never miss grabbing a Zomato promo code, coupon or any other offer each time you visit.